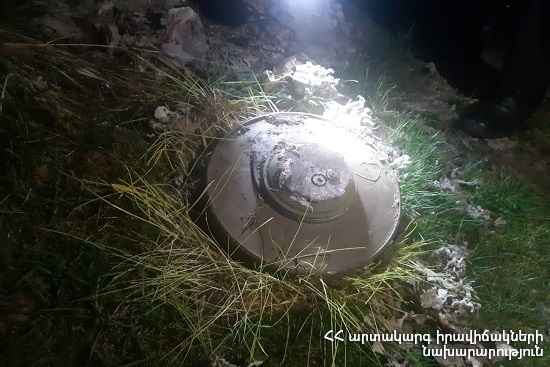 On April 16, at 19:44 information was received to “911” service that a mine was found on the roadway from Haykavan village to Voghji village, Shirak province. The operative group of the regional rescue department and a fire unit from the fire and rescue squad of the rescue service of MES of RA dispatched to the scene. It turned out that an anti-tank mine of У-TM-62П3 type was found in a gorge on the right part of the 1st km of Haykavan-Voghji roadway. The rescuers blocked off the scene. The officers of Akhuryan Police Department implemented patrolling since 20:48.